Located in North Scottsdale's prestigious, private, gated community of Bellasera, this home was recently totally renovated. Custom, 2500-square-foot, fully decorator-furnished and equipped. This three bedroom, 2.5 bath home has everything you need for a perfect month, or more. Enjoy this home that is outfitted with everything. Equipped with a private hot tub and custom-designed pool with plenty of patio space, a built-in barbecue and wet bar, gas firepit, fruit trees, and much more. From the back yard you will enjoy mountain and desert views to the east, or venture out the front door to start the day with morning exercise by taking a short walk to the top of Lone Mountain or a few sets of tennis. The master bedroom has a pillow-top, king-size bed with new TV. The guest room has a queen-size bed. The family room has a big-screen LED TV with DVD, indoor/outdoor surround sound stereo system, and fireplace. 3rd BR has queen hideabed. Pets may be allowed (with restrictions) and No Smoking. Cable and WiFi provided. The Community Center, located one-half mile from the home, has a large beach entry pool, lap pool, weights, cardio equipment, lighted tennis courts, basketball court, and much more... Bellasera is located only 30 minutes from the Phoenix Skyway Airport, 90 minutes from beautiful Sedona, and only a couple of miles from the small towns of Cave Creek and Carefree, where there are great restaurants, shopping and golf. We are 60-something and semi-retired. We spend some time at our Scottsdale home and have furnished it so that we, and our guests, will have every comfort. In fact, we totally re-decorated and updated (including a great new master bath and patio area!) We love to garden and the landscaping is superb. The remainder of the year, we are either traveling or at our home in Bend Oregon. Our home is in a wonderful community, with lots of recreational facilities and good neighbors. BUT, we have a great deal of privacy and a view of Lone Mt. out the back. We are close to great restaurants, hiking, biking, shopping, etc... but love to come home and 'chill' on the patio, where it is very peaceful and quiet. All the basics are supplied. Fully equipped with top dishes, cookware, serving pieces and small appliances. citrus and fruit trees, herbs, and lots of potted flowers. Large patio offers both sun and shaded areas. plus quiet side patio. 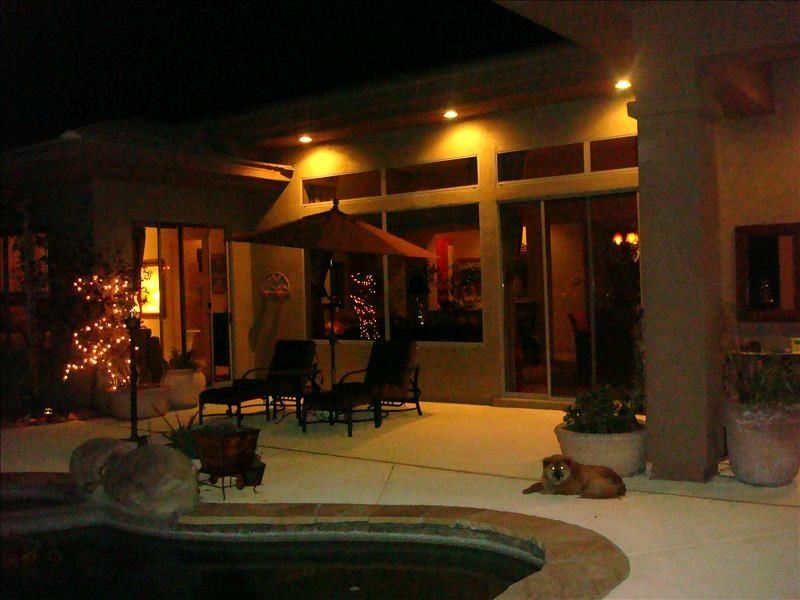 very private, two outdoor dining areas and fire pit,designer furnished, citrus trees, extremely well maintained.